The essential requirement for a combustion control system is to correctly proportion the quantities of air and fuel being burnt. This will ensure complete combustion, a minimum of excess air and acceptable exhaust gases. The control system must therefore measure the flow rates of fuel oil and air in order to correctly regulate their proportions. A combustion control system capable of accepting rapid load changes is shown in Figure . Two control elements are used, 'steam flow' and 'steam pressure'. The steam pressure signal is fed to a two-term controller and is compared with the desired value. Any deviation results in a signal to the summing relay. The steam flow signal is also fed into the summing relay. The summing relay which may add or subtract the input signals provides an output which represents the fuel input requirements of the boiler. This output becomes a variable desired value signal to the two-term controllers in the fuel control and combustion air control loops. A high or low signal selector is present to ensure that when a load change occurs the combustion air flow is always in excess of the fuel requirements. This prevents poor combustion and black smokey exhaust gases. If the master signal is for an increase in steam flow, then when it is fed to the low signal selector it is blocked since it is the higher input value. 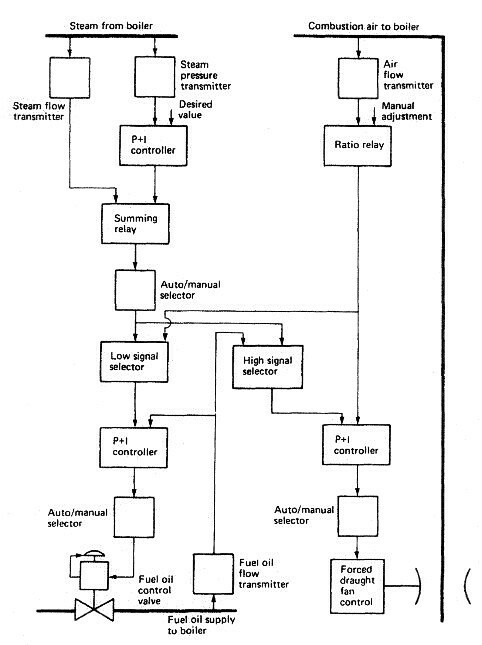 When the master signal is input to the high signal selector it passes through as the higher input. This master signal now acts as a variable desired value for the combustion air sub-loop and brings about an increased air flow. When the increased air flow is established its measured value is now the higher input to the low signal selector. The master signal will now pass through to bring about the increased fuel supply to the boiler via the fuel supply sub-loop. The air supply for an increase in load is therefore established before the increase in fuel supply occurs. The required air to fuel ratio is set in the ratio relay in the air flow signal lines.